There is nothing that Cris from Ranserve can’t do. Framing. Drywall. Concrete. Electrical. Plumbing. Hang fans. Think ahead, plan how to do it. 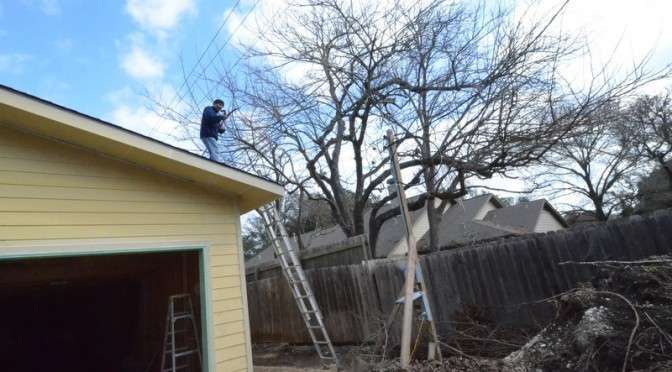 Today, above, he’s up on the roof, trimming limbs back to clear the route that the City of Austin will use to connect the house to electrical service at telephone pole behind the house. 15 minutes later, back on the ground, armed with multi-tool, Cris has already trimmed drywall away from behind the vanity counter in bath 2. 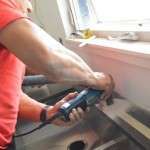 He will inset the backsplash into the slot in the wall. 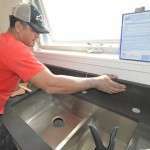 This allows the faucet handles to turn free, without banging against the backsplace if the quartz were mounted against the drywall, instead of inset into the drywall — an idea that Ron thought of. Upstairs in bath 3, Cris deploys the multi-tool to cut around the backsplash. 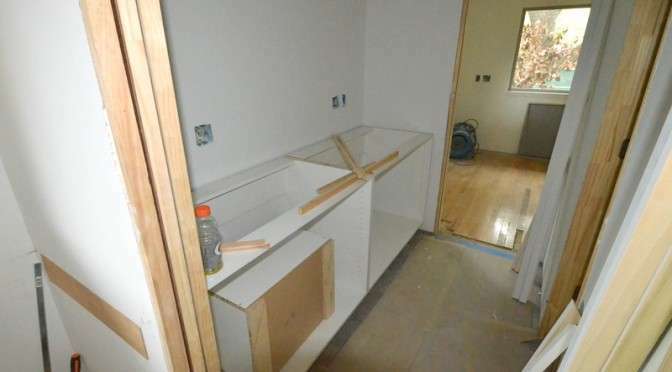 He will remove the drywall from this location, as he did in bath 2, then inset the backsplash quartz into the wall, allowing the faucet handles to swing through a complete arc without obstruction. 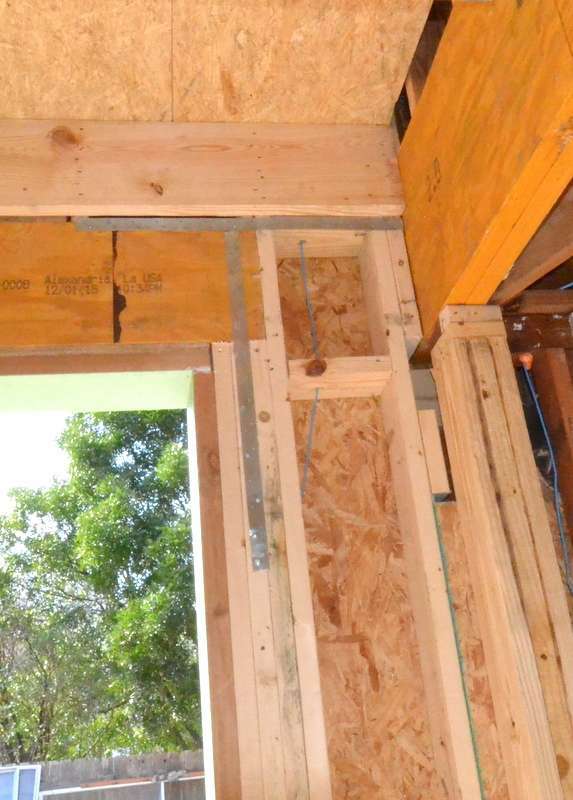 Before Steven arrived, Cris removed one of the two metal straps bracing the horizontal and vertical framing of the new garage door, turned it vertical, nailed it into position — per instructions from the structural engineer. The City of Austin requires this to prevent uplift when the wind blows strong — kind of like today, with 30mph wind gusts. 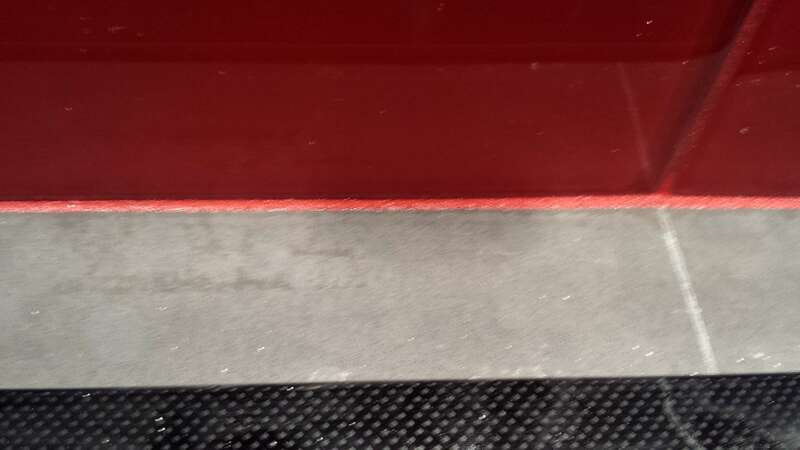 Heres’ the same strapping change at the left side of the garage door. Robert the roofer set to work yesterday nailing shingles to the new roof over the new garage. He returned early today to continue. Steven stepped out the side window of the master bedroom, onto the roof, to see and ask questions. 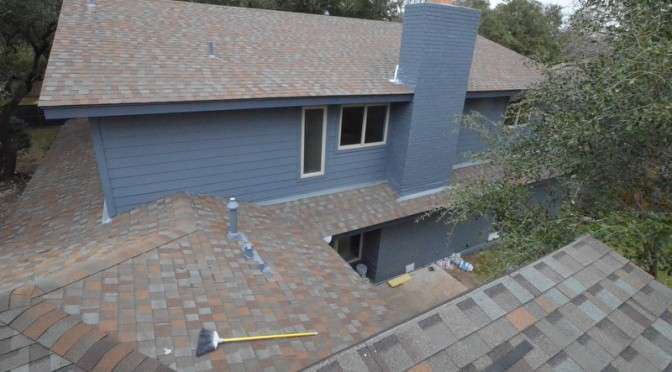 Above, standing atop the new roof over the new garage, looking back to the house, this is the first time Steven has seen the old and refurbished roof from this altitude — all of about 20+ feet above ground. The new cricket is clearly visible at the back of the chimney. The roofers added this to push water away from the brick. There was no cricket when Steven and Jacquela purchased Emerald Hill. When we opened up the walls in bedroom 4, we discovered water damage and some mold traveling between the roof and chimney, down the brick, behind the sheathing. 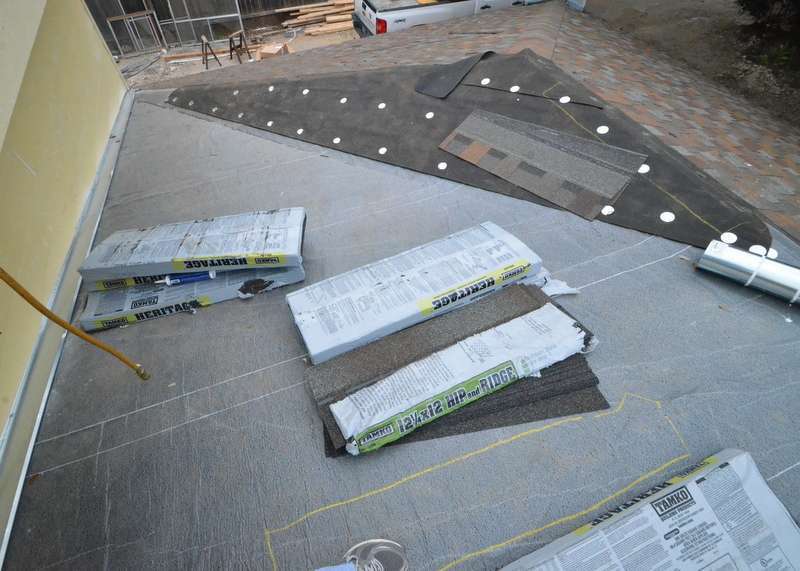 Early in the morning … When Ranserve constructed the new garage bay, we added an oversized cricket atop the existing garage to push water away from the new structure. 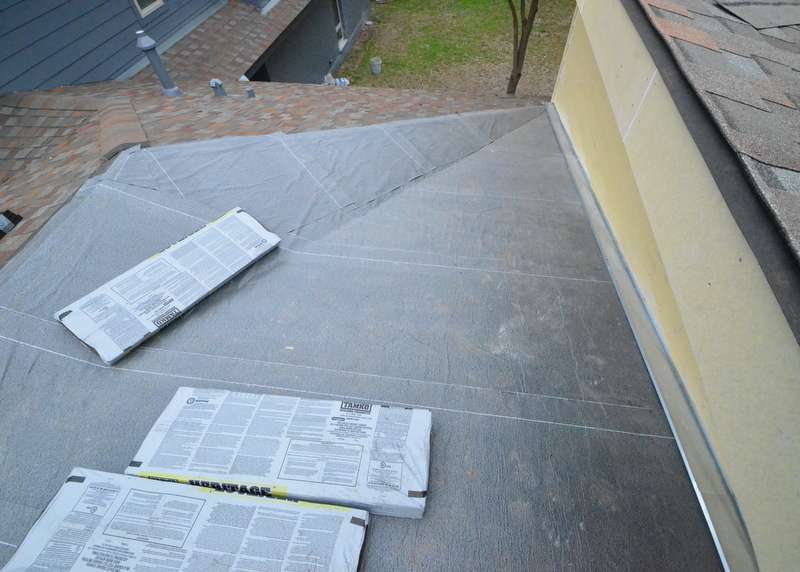 At a low pitch of 3/12 and 4/12, the roofers opted to put down the heavy adhesive membrane that normally protects flat roofs — instead of conventional tar paper or felt. Robert outlined with yellow chalk where he will mount ridge vents. 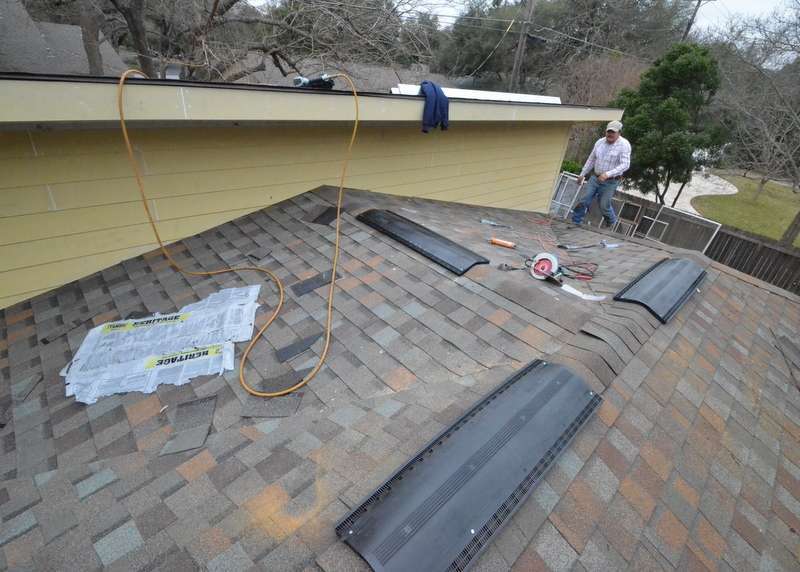 Later in the day … with the ridge vents installed, Robert is cleaning up, nearly done. 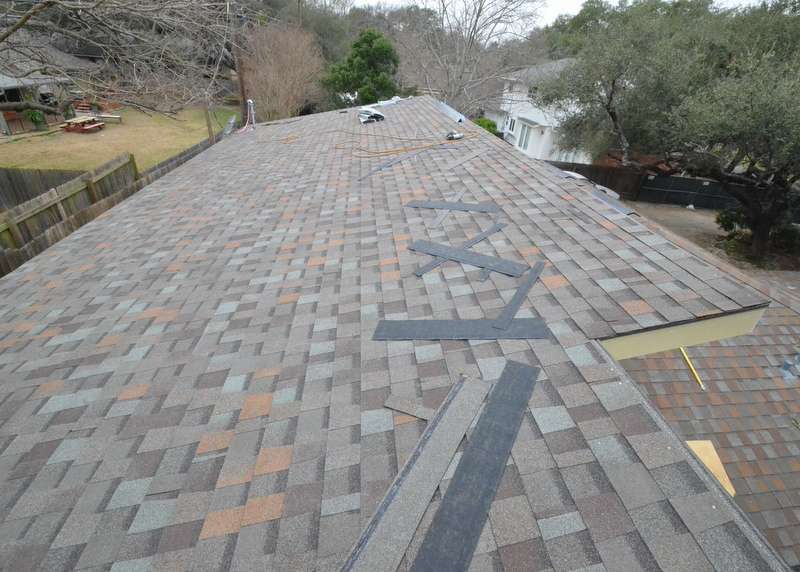 He still has to install drip edge along the high end of the new roof. Steven went for a stroll, carefully, on the new roof above the new garage. 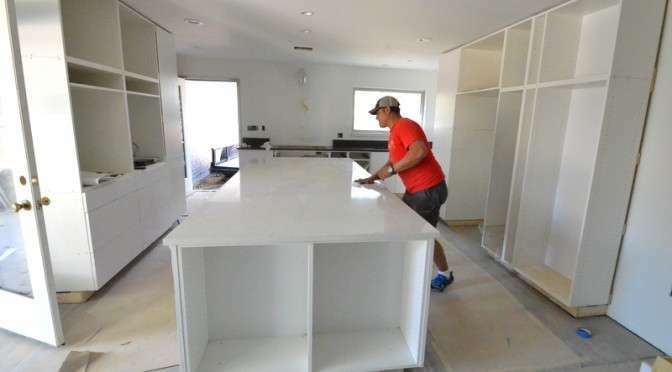 In the kitchen, the quartz countertop is reinstalled to the island. That’s Ron Dahlke, supervising his kingdom. 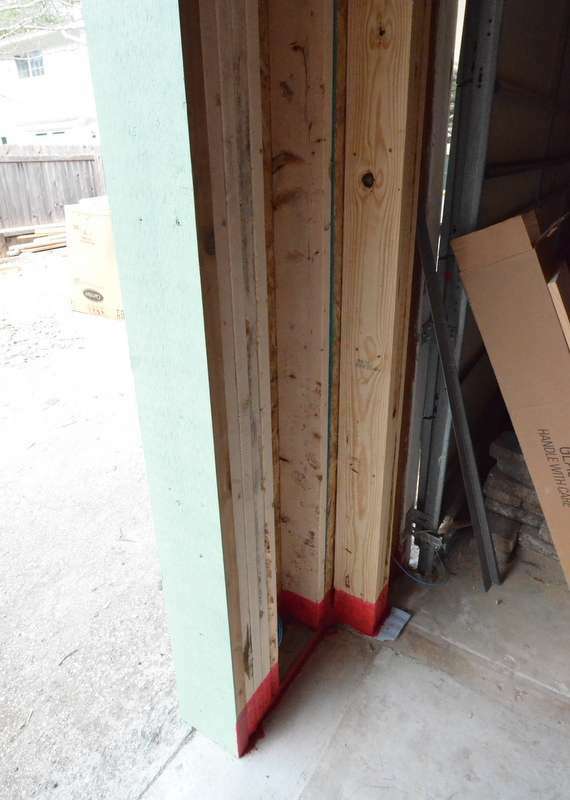 The structural engineer required Ron to add waterproofing to the lumber at the garage door framing for the new and old garages. Steven received from Cowart the quote for the new garage door for the new garage bay — and approved it. 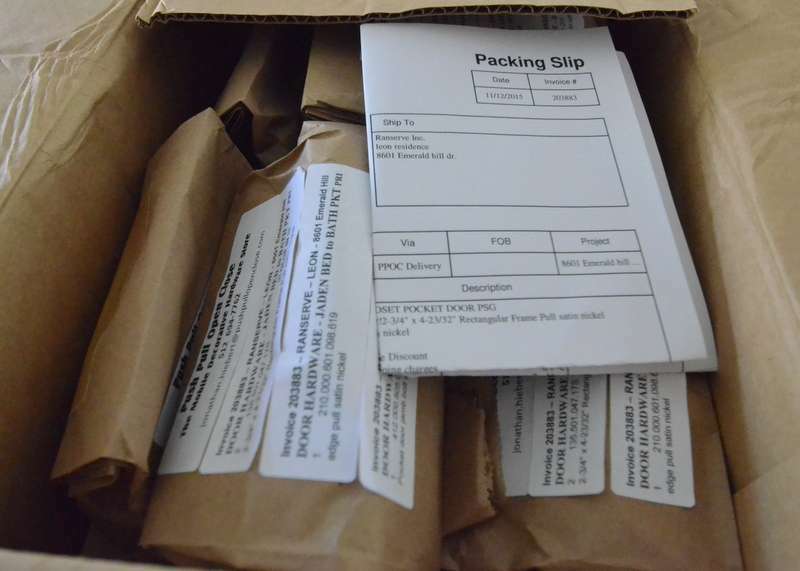 The glass door kit for the fireplace arrived today. Ron and Matt started to clean up the garage; it’s almost time to scrape up the old linoleum tiles, acid wash the glue away, and turn the garage over to Steven and Jacquela. Saturday. Jacquela and Steven visit Emerald Hill to consider the quartz island by daylight. 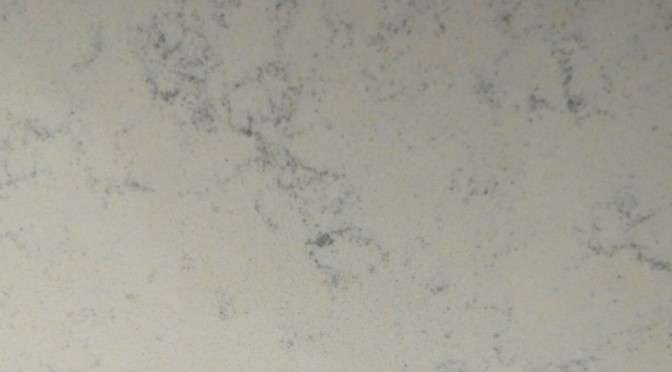 Above, a close-up without flash of the fine gray veins inside the fairy white quartz of the island countertop. It’s going to take brilliant lighting to properly photograph the subtle threads that emerge from inside the stone — coming as soon as we power up the electric grid and kitchen LEDs. We come today to where this remodel began. The kitchen. We know it for the first time. 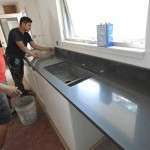 It takes minutes to install a countertop on This Old House and other home improvement shows. Today’s adventure at Emerald Hill debunks those happy breaks between commercials where installers go from demo to granite in before and after shots. In contrast, we began at 9 am and ended about 3 pm — but these six hours are some of the most consequential since ripping down the drywall. We have kitchen counters. The material is quartz — shadow gray at the kitchen sink and cooktop, fairy white at the island. These are selections that Jacquela and Steven approved 16 July 2015 — four months ago. One of the first decisions we made. With the cabinets mostly installed, with the countertops installed today, the idea around which the kitchen is organized, the idea that Steven first proposed in September 2014, 14 months ago, drawing sketch after sketch of how to get the kitchen we wanted into this house, that idea is finally made physical. We knew when we bought the house that it needed a new kitchen. 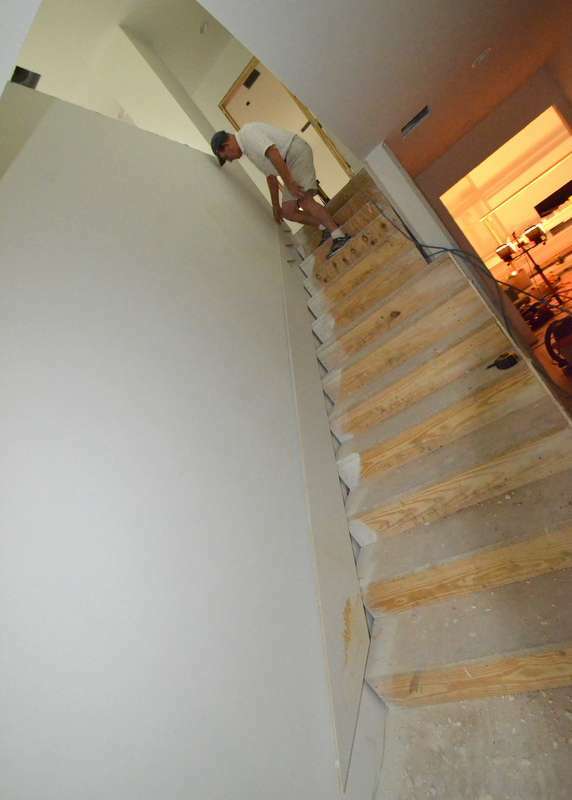 We wanted to take out the wall between the existing kitchen and the existing family room. Putting in the new kitchen required that we put in new copper wiring. Several architects and builders advised that the City would require us to rip out all the original aluminum wiring. So … what was supposed to be a new kitchen remodel became gutting the house down to the studs. 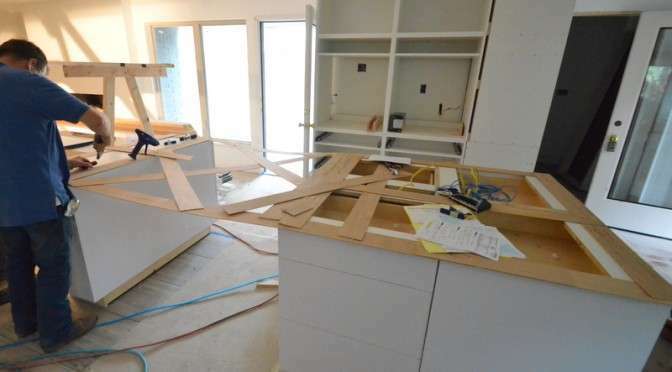 Which gave Steven the ability to turn the kitchen 90 degrees — from the original east-west axis to, instead, north-south, taking out the wall, uniting the kitchen with the family room — and also creating a walk-in pantry. Before — the existing kitchen as it was inspected, just before Jacquela and Steven bought it. The wall to the left of the photo divides the kitchen from the family room. 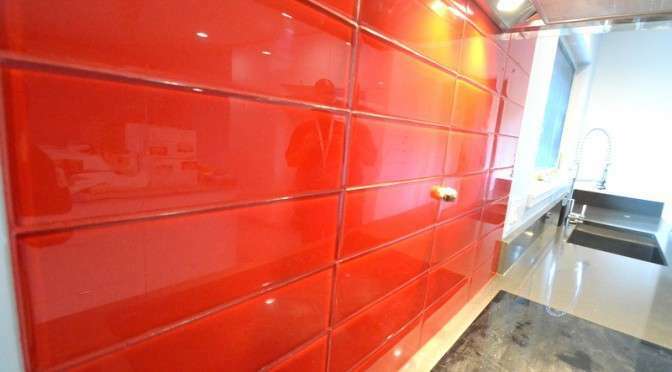 Behind the red wall is a small vertical closet used as a pantry, a water closet with toilet, and the utility room. To the right is the four-burner electric cooktop, with a downdraft exhaust fan that is duct-taped to a vent through the exterior brick. Saltillo tile on the floor. A four-tube fluorescent fixture that was installed as part of a remodel — we guess sometime during the 70s or 80s. Everyone who has worked on this house has worked to make this day possible. Thank you. Let’s begin the photo tour. Efrem backs the trailer up to the side door off the kitchen. Hazil directs. Marcello rides the trailer to signal when to stop backing up. 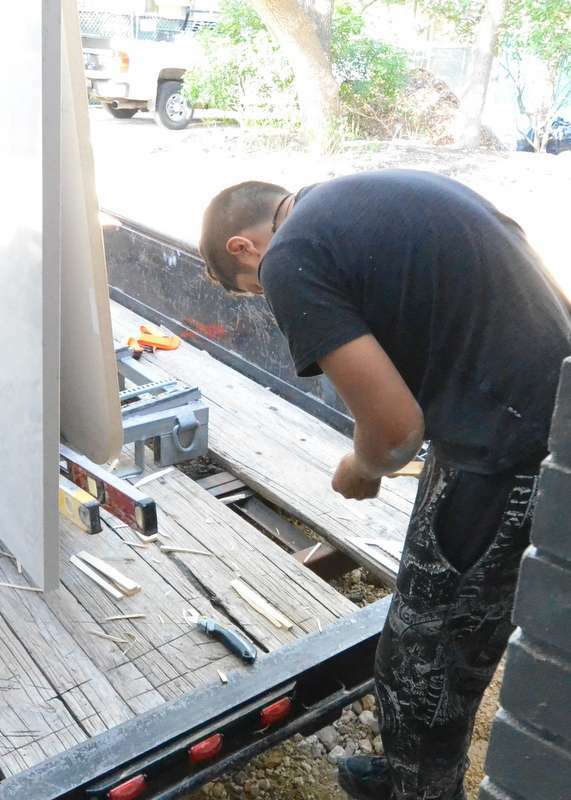 The first section of countertop to enter the house comes off the trailer, carried by Hazil. 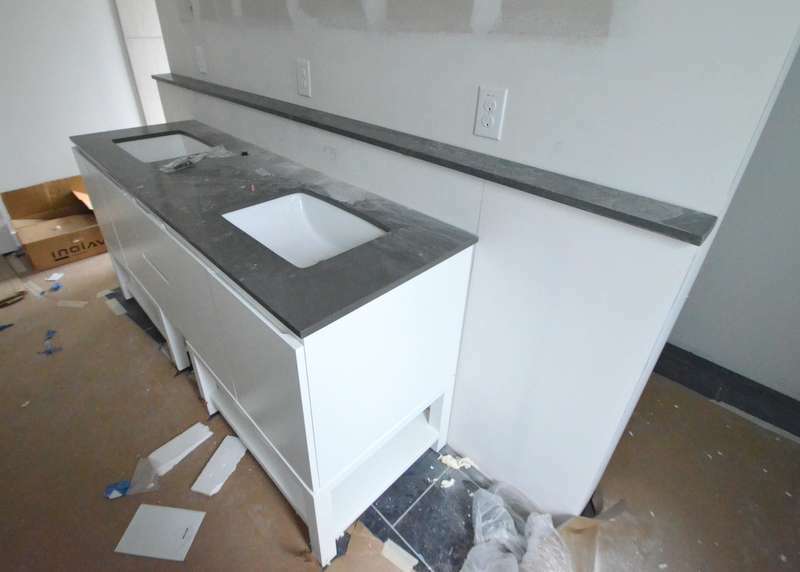 This is the counter that will be installed inside a cabinet, creating an exposed workspace for the toaster oven and other devices. Remarkably, this will also be the last piece of quartz installed at the end of the six-hour installation — first in, last done. Hazil carries in one of the backsplash pieces. Efrem in red shirt, and Hazil, at right, carry in the left side of the cooktop/sink counter. 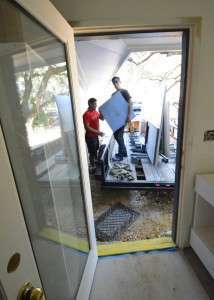 Efrem and Marcello navigate the long slab of the sink counter off the trailer and through the kitchen door. Navigating the slab around the island cabinets, swinging it toward the kitchen window. Marcello pushes from the middle while Efrem and Hazil steer the slab into place. The counter on this wall runs more than 12 feet long. It requires two slabs of quartz. 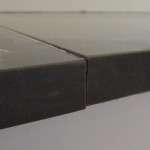 Where the two slabs meet, they are both flush against the wall when placed into position, but the front edges do not align. 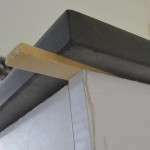 Efrem proposes to Steven and Ron that he slice open the drywall in order to be able to slide the longer right-side slab into the drywall, insetting it, until the front edges of both slabs meet evenly. Steven and Ron approve. 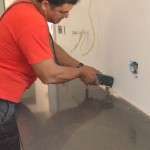 Efrem uses a multitool to slice open the drywall, using the top of the slab as his cutting guide. 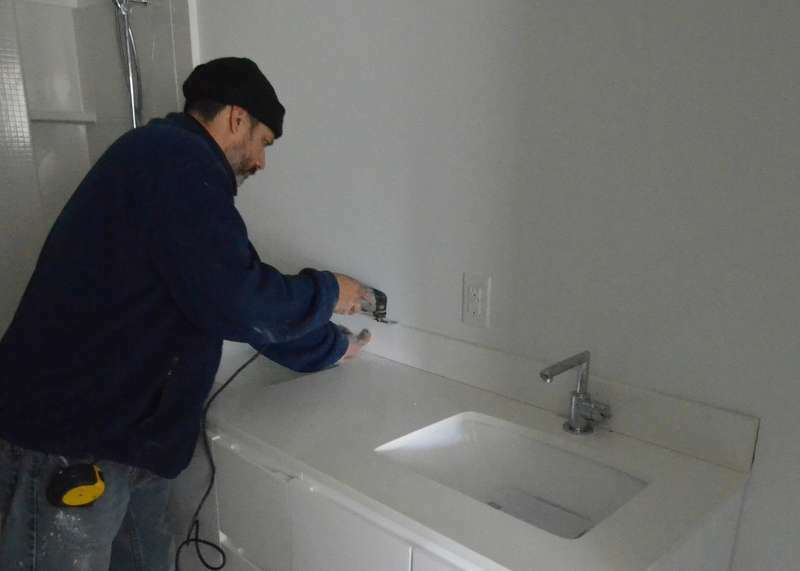 At the cutout for the sink, Efrem slows the multitool to ensure the slab does not vibrate and then fracture. 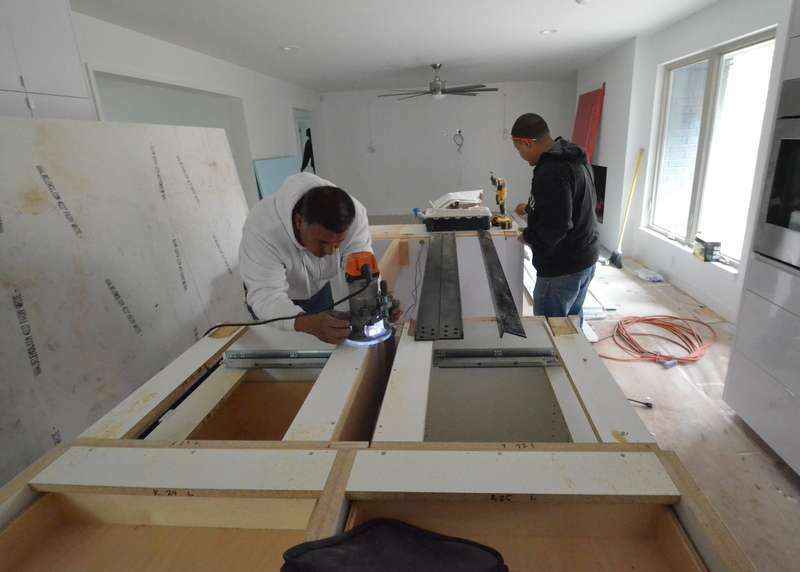 Efrem and Marcello slide the long slab into the drywall slot. 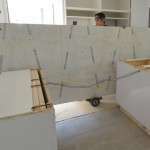 With the drywall sliced open, the slab slides into the open slot, allowing Efrem to nudge the front edges to proper alignment. Problem nearly solved. The front edges are nearly aligned. Now comes 20 minutes of tweaking with shims and levels. 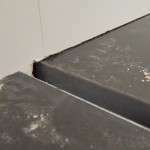 To level the slabs, Efrem inserts shims. 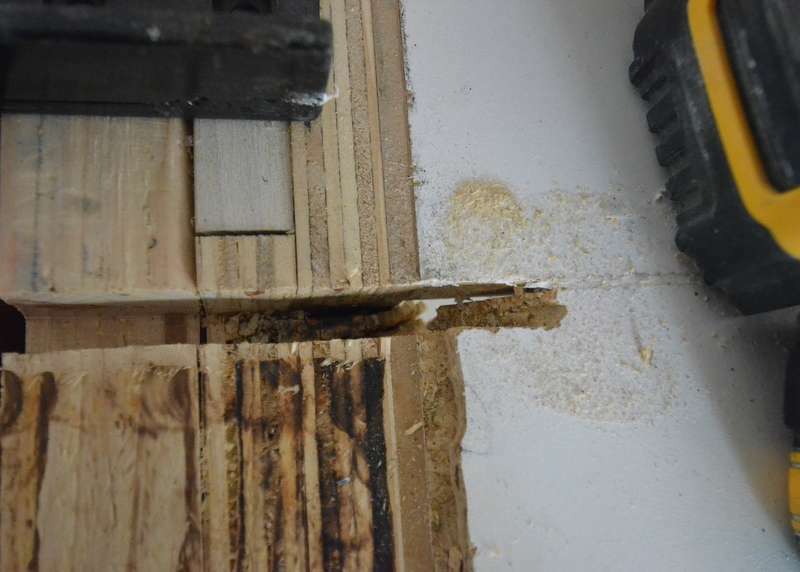 This is how Marcello makes shims — slicing out wedges from a 2×4, by hand, by knife. There is a four-foot wide gap between the storage cabinets at one of the island and the shelf that supports the other end. In between, Jacquela and Steven plan open seating on stools. 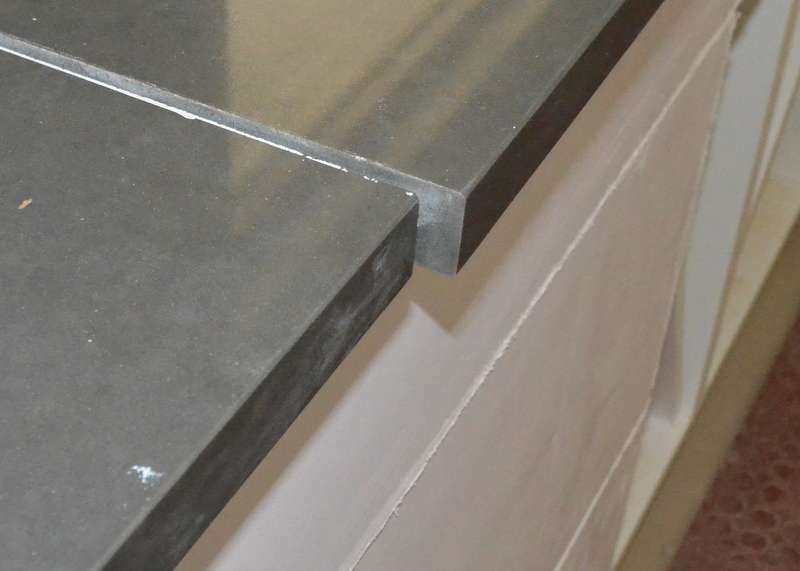 To bridge the gap, we need steel braces to help support the quartz countertop. 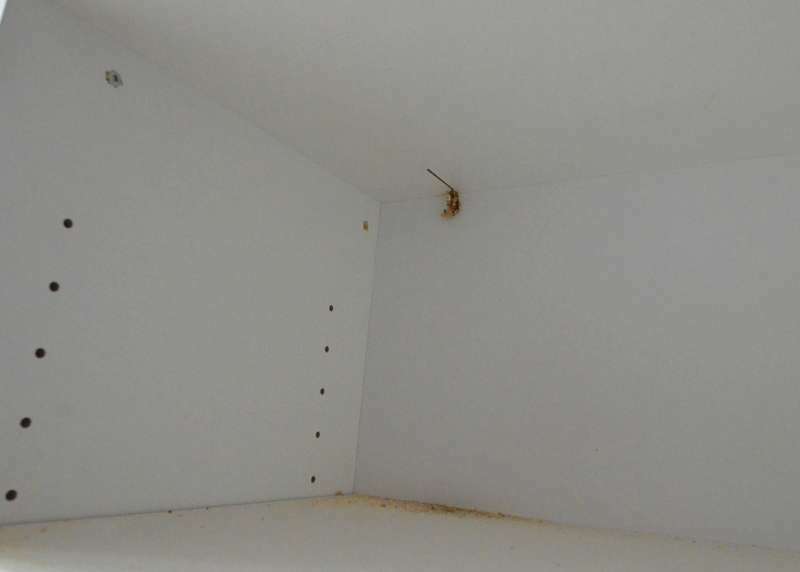 The braces must be inset into the cabinets, which requires routing out slots in the cabinet frames that are about 3/8ths inch deep. 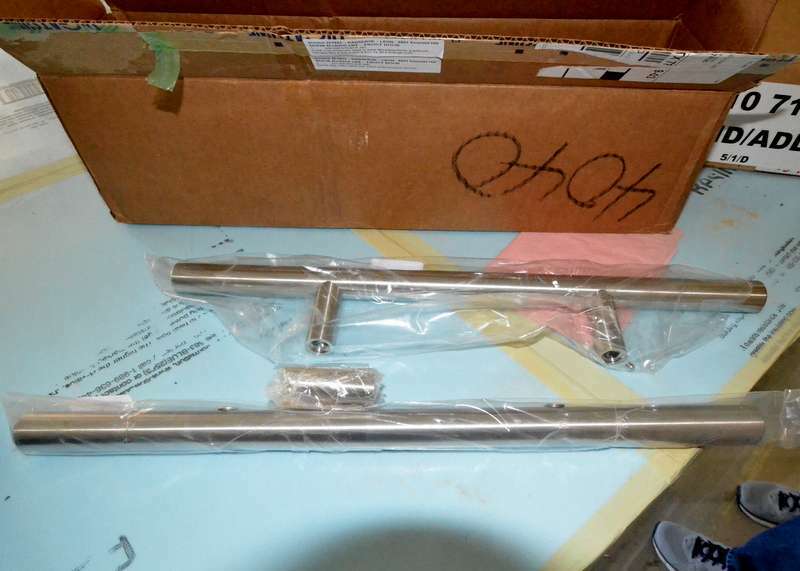 Efrem arrived with 12-inch brackets that are normally used to support overhangs — but Steven and Ron specced long, strong and heavy brackets that bridge the gap. 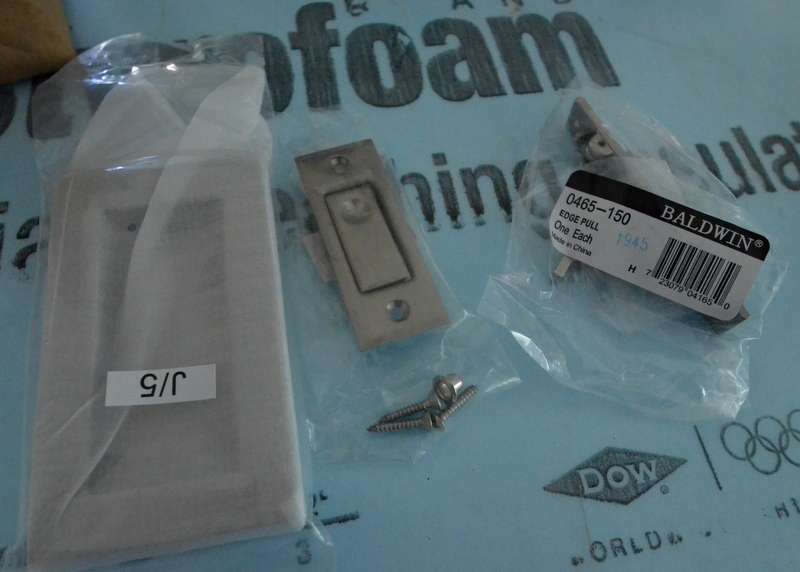 Ron called Austin Stone Works to confirm these are what is needed. ASW called the quartz maker, which confirmed that we need the long brackets. 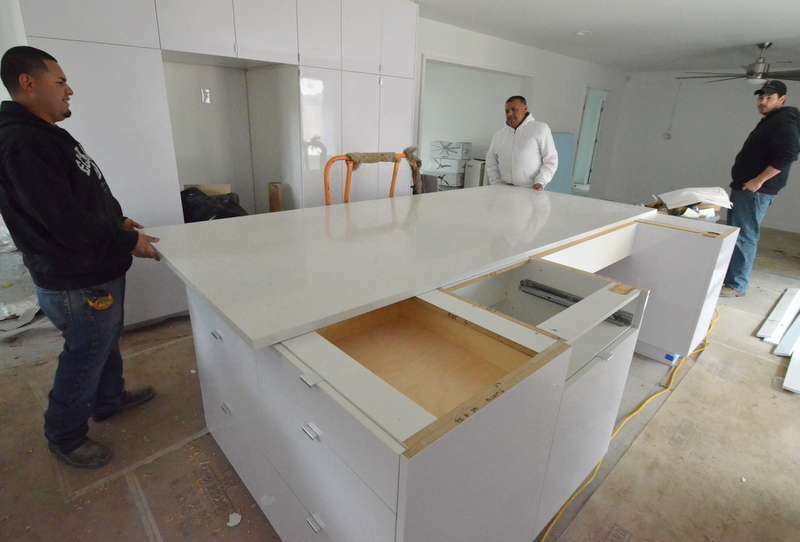 As a result, Efrem and team will slide the island countertop into place, temporarily, to return when the longer brackets are delivered for installation. At the shelf end of the island, Cris and Ron install additional lumber to create a platform for the brackets. 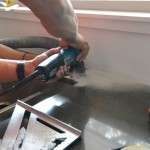 Efrem uses an angle grinder to remove a screw head that the router bit can’t cut away. Hazil routes out a slot at the top of the shelf cabinet at the back of the island. He freehands the cut — no template — slice by slice. His attention on detail is intense. 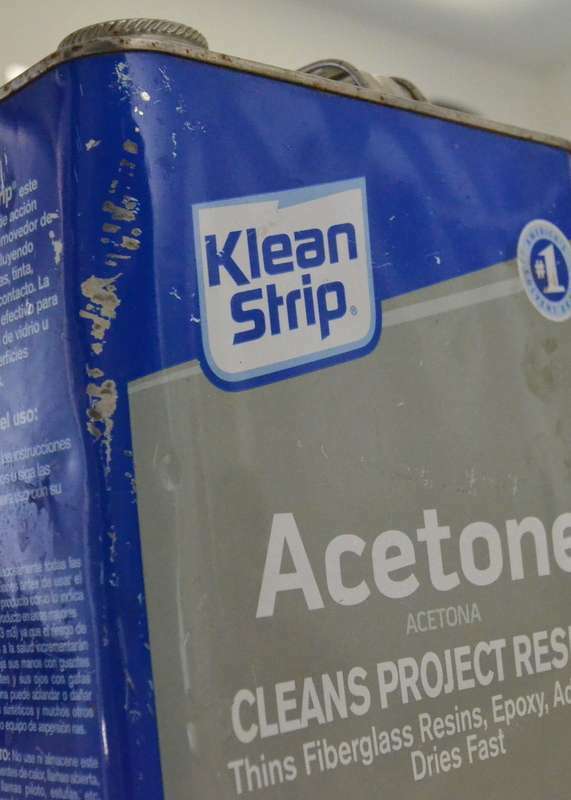 Efrem and team use Acetone to wipe clean the quartz countertops, each step of the install process. It’s clean enough that Efrem sets down his apple for lunch. He’s earned the first meal to be served from the new counters. 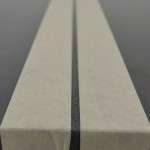 The joint between the two slabs will be sealed with epoxy, with the goal of attempting to make the two slabs appear seamless. 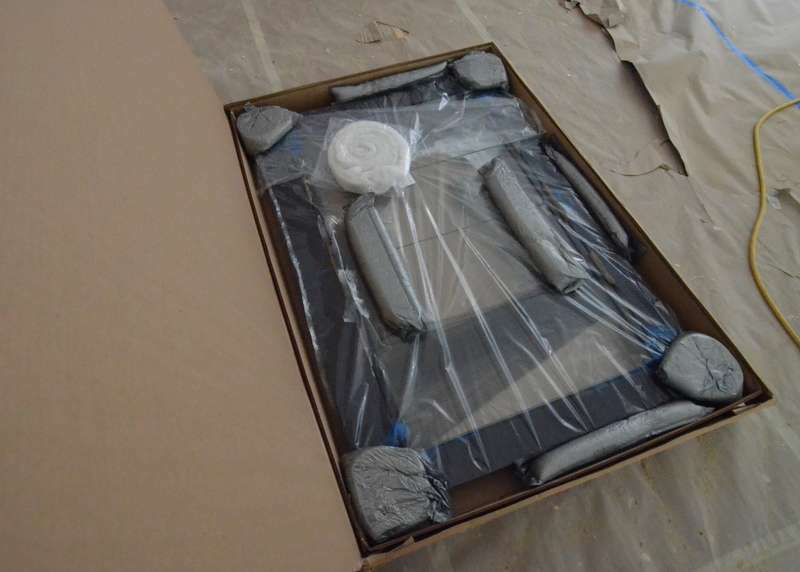 Efrem begins with yellow epoxy and black colorant. Efrem adds a drop of white to the black mix. That is all it takes to create a grey that nearly matches the slab. He will also add a very small drop of brown, mixing by eye and experience. The color mix is ready. Hazil pushes the two slabs tight as the first application of epoxy sets. Efrem scrapes clean the extra epoxy that oozes from the seam between the two slabs as Hazil compresses the gap. That ends the first application of epoxy. Efrem lets it set up and begin to solidy. After the first application is solidified, Efrem preps for a second application of expoxy. He tapes the slot between the two slabs. Efrem uses a razor blade to spread the second coat of colored epoxy. 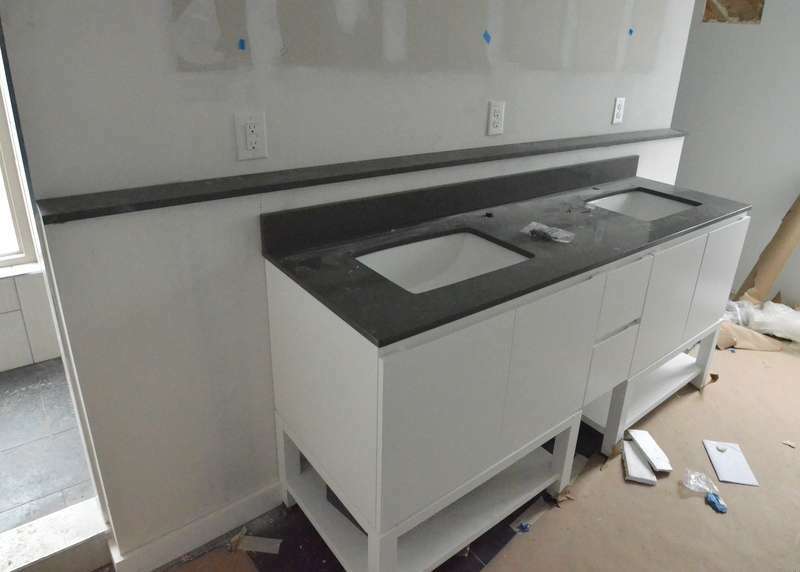 At the right side of the sink, Hazil uses silicon to seal any gaps between the quartz and cabinet against penetration by liquids. 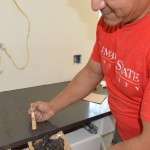 Hazil caulks the joint under the slab where the quartz meets the cabinet frames. 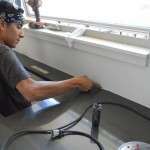 Moving left from the sink, Hazil continues caulking the joint where the slab meets the wall. 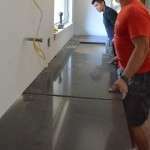 Marcello delivers the stainless steel sink to the countertop. One of the clamps that Efrem uses to mount the sink under the slab. 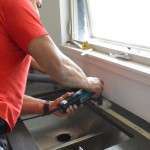 Efrem uses an angle drill with a stone-cutting bit to drill for the sink faucet fitting. Drilling out the slab creates a pile of dust that will be vacuumed away. Drilling out for the button that switches on the disposal, at the right side of the sink. 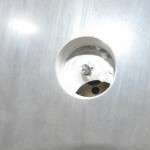 The hole in the slab after it is drilled out, with the stainless steel frame of the sink still in place. 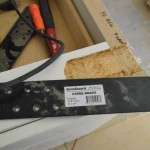 The stone-cutting bit does not cut steel. Efrem needs a steel-cutting bit for that second procedure. 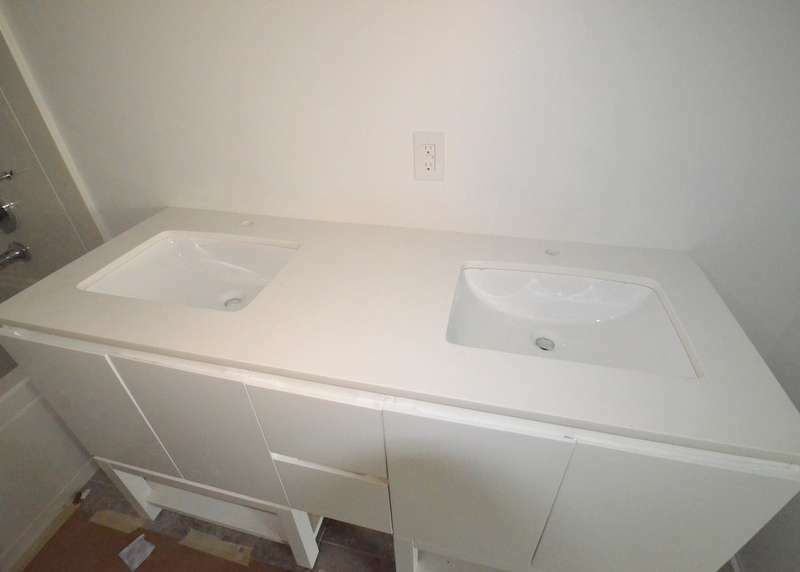 As might be expected, the default sink holes that are already drilled into the frame of the sink do not align perfectly with the available slab and precisely where the faucet must be mounted. 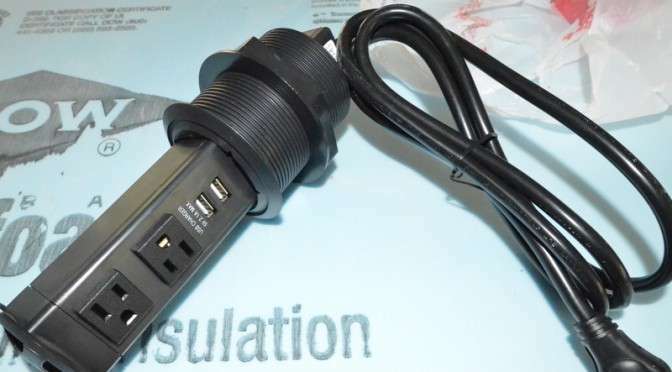 The plug of quartz cut away by the angle drill and stone-cutting bit. 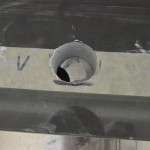 The hole for the sink faucet as Efrem begins to drill away the stainless steel from underneath. 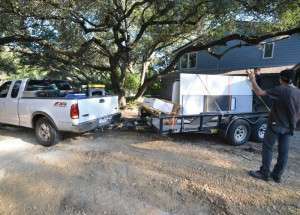 Ron Dahlke picked up the cooktop from Harway yesterday afternoon. Today, Efrem unpacks it and measures it. 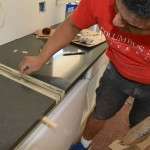 Efram first tapes up the countertop and transfers the cooktop dimensions to the tape, carefully ensuring the cooktop is properly centered and square with the centerline of the kitchen. Only then does he begin to drill out the corners of the cutout. 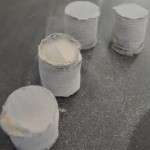 These are the quartz plugs removed by the stone-cutting bit. Efram begins at the left side of the cutout. Efram slices away the right side of the cutout. Efram chisels out the last bridges of quartz holding the cutoff in place. Marcello pushes up the cutout from below. Efram pries it higher from above. Marcello lifts away the cutout. 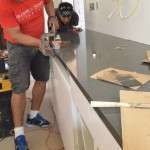 Efrem finishes the cutout with a saber saw, removing part of the cabinet framing to ensure the cooktop sits flush with the countertop. Efrem and Hazil carry the cooktop to the counter. 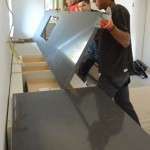 Efrem and Hazil slot the cooktop into the cutout. 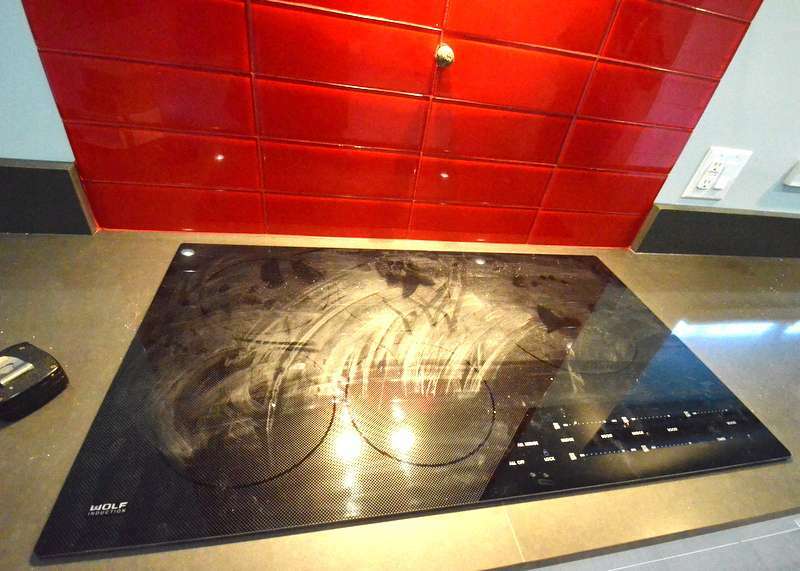 The cooktop successfully in place. 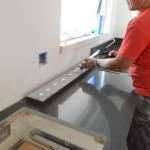 Test-fitting the sections of backsplash quartz. 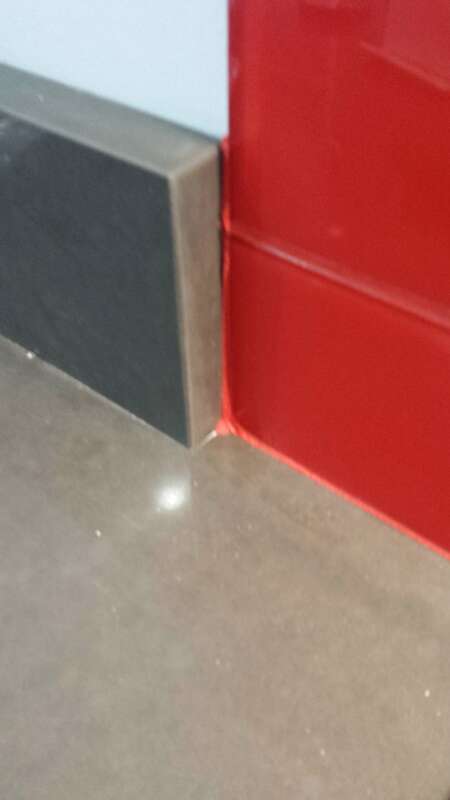 Ron Dahlke test fits one of the red tiles that will create the backsplash up the wall behind the cooktop. 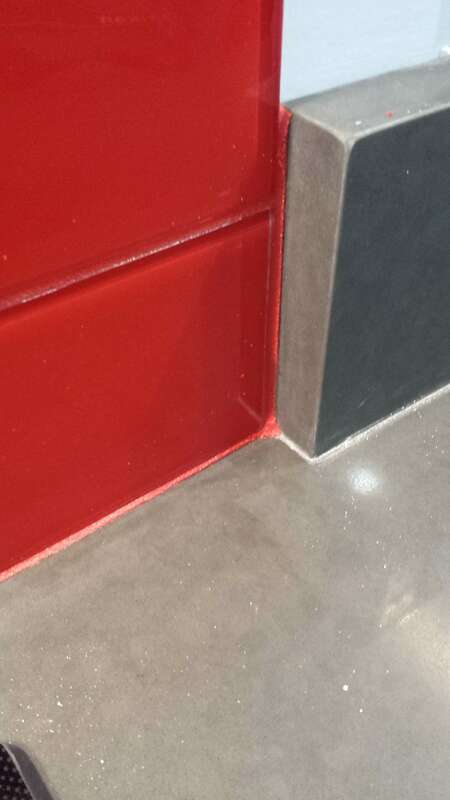 To center the red tiles, Efrem and team will have to take 3/4 of an inch off one of the longer sections of grey quartz backsplash. 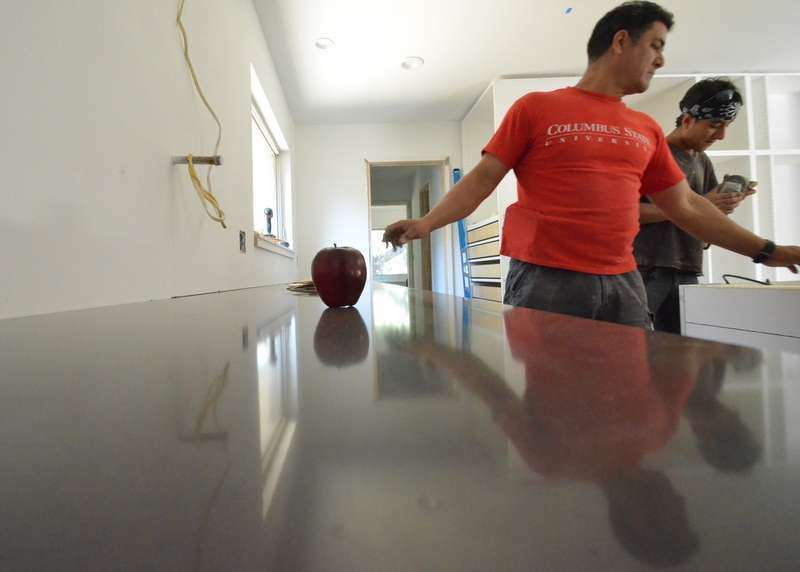 Marcello, left, and Hazil, right, cut, grind and polish the edge on the final section of the backsplash. This will be installed to the left of the cooktop. 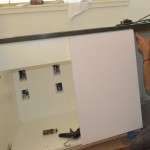 Dabs of silicon to the back of the backsplash hold the section to the wall. Dabs of silicon on the second section of the long wall. 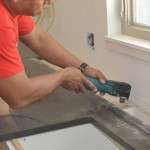 Efrem applies epoxy to seal the joint between two sections of backsplash. 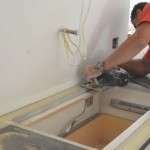 With the epoxy ready, Efrem squeezes together the two sections of backsplash. 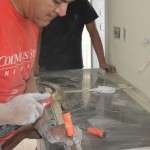 Efrem seals the gap between the backsplash and countertop with silicon that goes on white but dries clear. 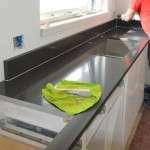 It took more than five hours to install the cooktop/sink countertop — meticulous and careful work. 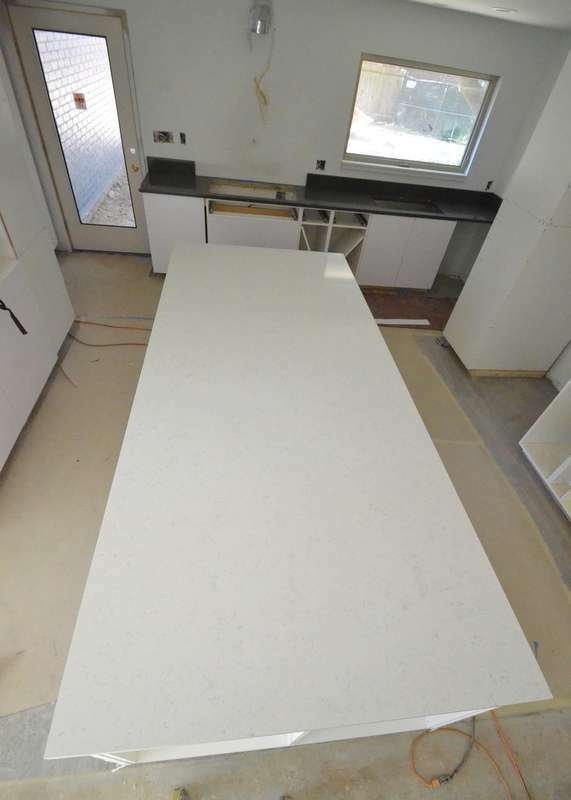 By contrast, the 5-foot-by-10-foot slab of quartz for the island goes in in less than 30 minutes — no cuts required. This beast weighs more than 400 pounds. Efrem, Marcello and Hazil moved deliberately, rehearsing each step. Released from the clamps on the trailer. Through the doorway and into the kitchen. 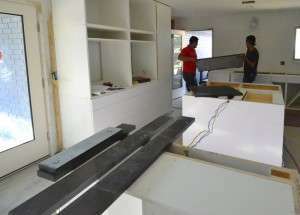 Down on the cabinets, shifting the slab into final position. 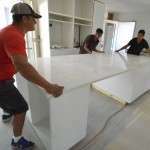 Efrem wipes down the island slab with acetone. 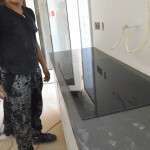 To finish for the day, Efrem installed and cleaned the first slab of quartz carried into the house — positioning it inside the cabinet to go under the toaster oven. 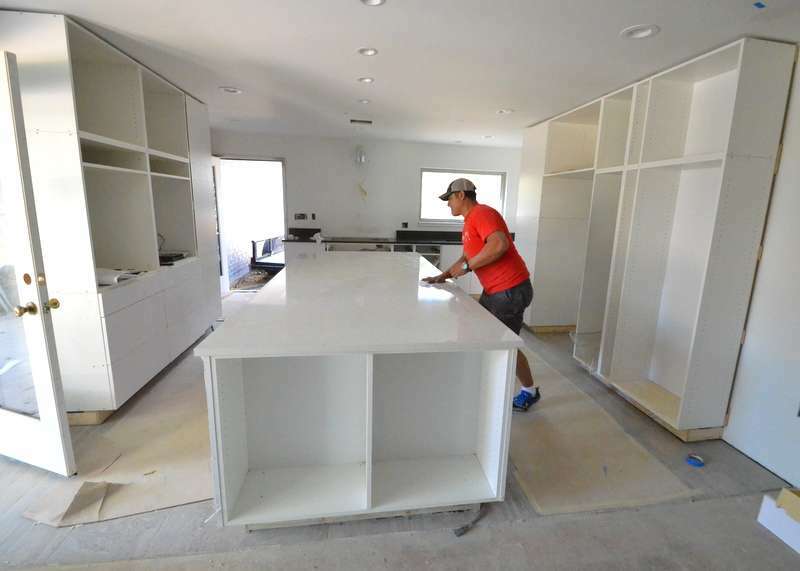 With the kitchen island cabinets now in place, “Dimensional R” from Austin Stone Works — he asks to not be named, and to not have his face photographed — is back to build the template for the kitchen island. 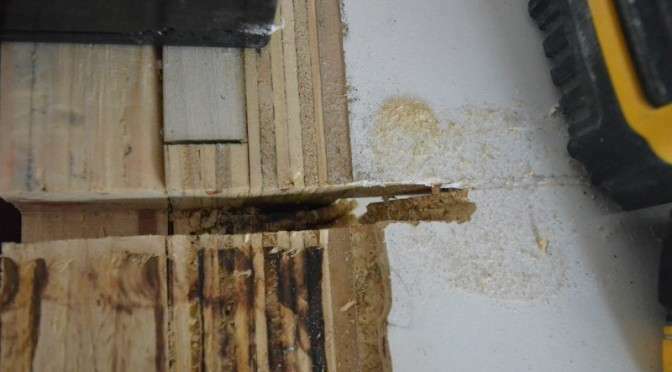 Today, R uses thin strips of wood instead of the white plastic. 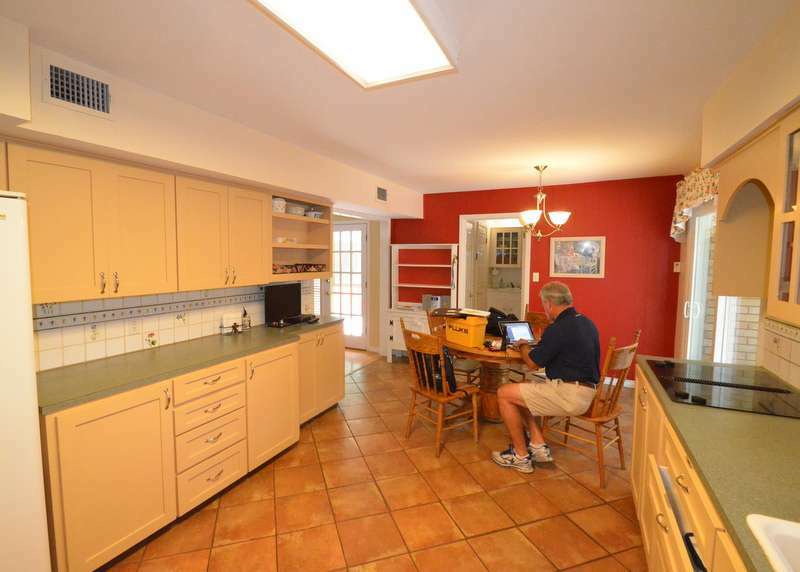 He has to span the storage cabinets at the right side of photo, above, across the open seating area where we plan to put four stools, to the shelf cabinet at the far left end of the island. The plastic will sag; the wood strips hold their dimensions. 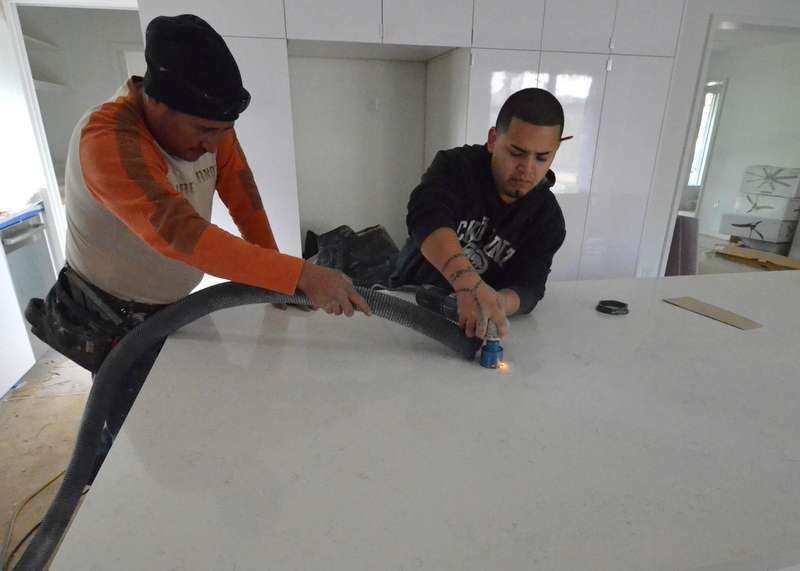 Everything must be clearly marked for the fabricators — which template abuts the next — in order for the quartz to be cut correctly. 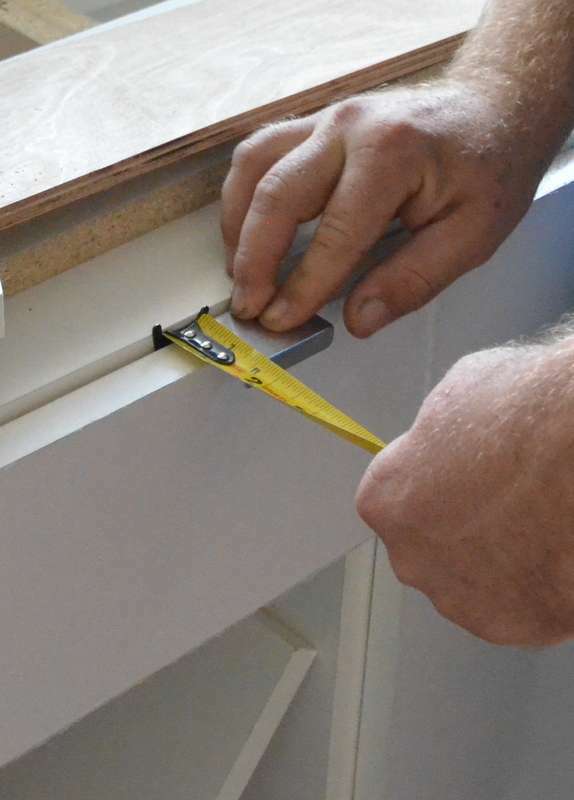 R opened a package of the cabinet pulls, using one as a reference to determine how far past the pull the countertop should extend — 3/4 of an inch out from the front of the cabinet box, where the tape measure starts, to just past the front of the pull. 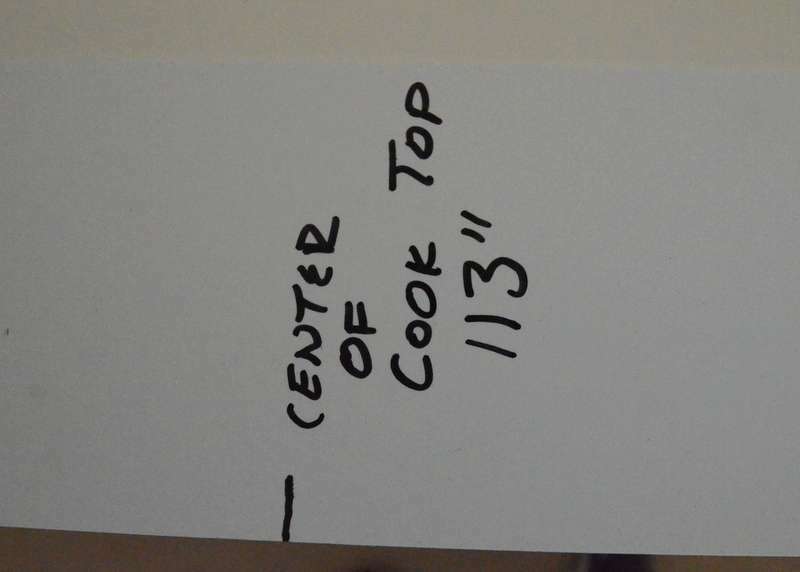 Now that he knows the pull dimensions and clearance, R builds an entirely new template for the counter that runs from the dishwasher past the sink and cooktop to the dog station at the end closest to the camera. It’s a dual-milestone day at Emerald Hill. The first is the arrival of the carpenters. 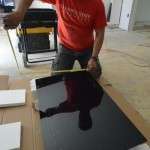 The second is … “Dimensional R” is in the house to measure for kitchen countertops. R asks Steven to not use his name — and to not “capture his soul” by photographing his face. He stays off the Net. 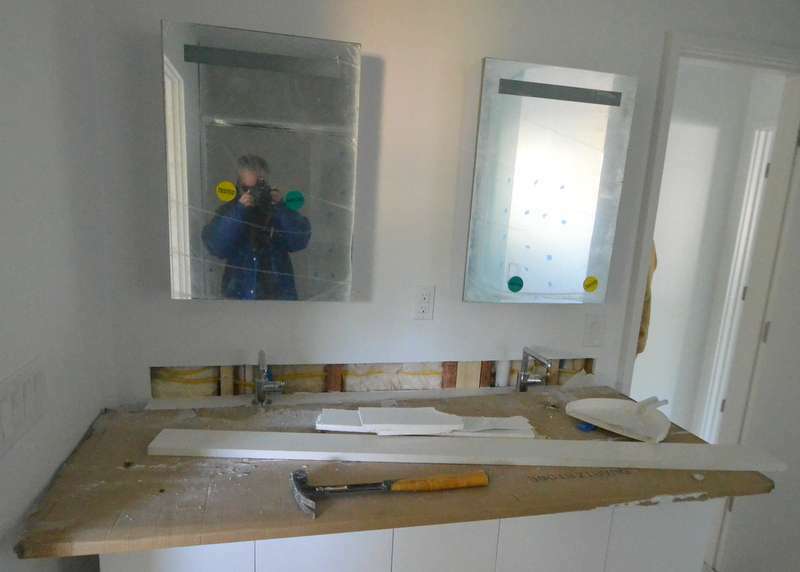 Steven complies by posting the photo above, the back of R’s head as he templates for the quartz countertop at the run of cabinets for the dishwasher, sink and cooktop. 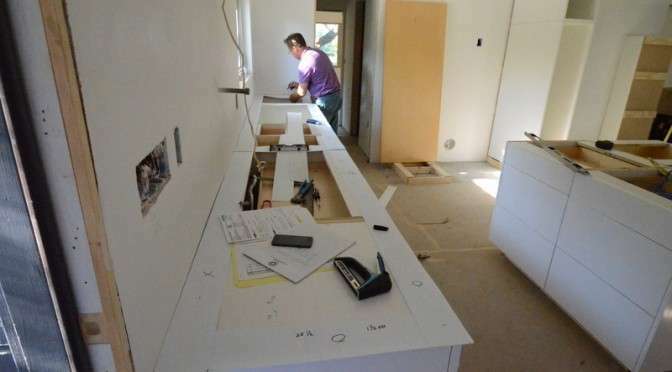 R uses strips of white plastic — not easily visible against the white cabinets — to template the counter. 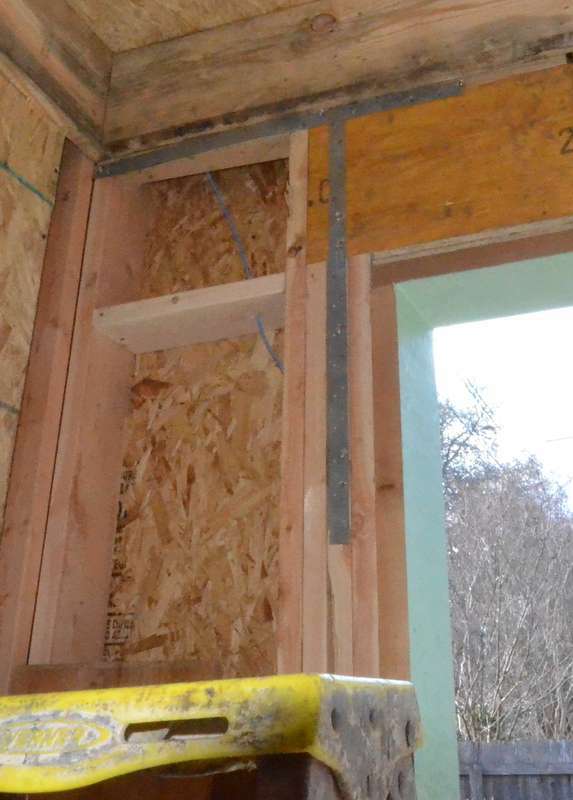 The first step is to determine what the overhang will be — 1/2 inch past the face of the cabinets, or 1/4-inch. Steven chooses the larger overhang to help keep dripping liquids further away from the front of the cabinet drawers and doors. 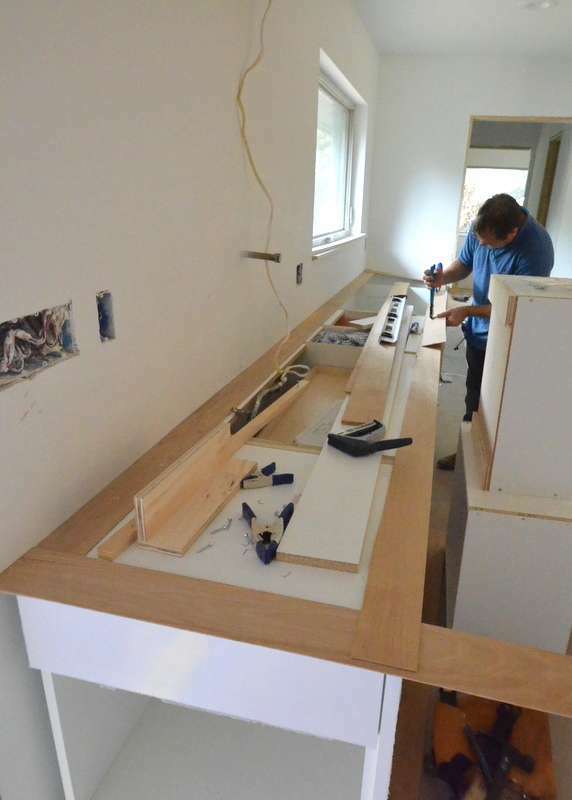 Next, R lays out the strips — and discovers that the cabinets are not perfectly square. Instead, they bow inward toward the wall all of 1/16th of an inch. 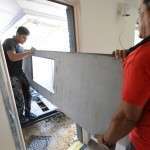 He computes the math and compensates with a series of strips that are first tacked into place with a staple-gun and then glued together. 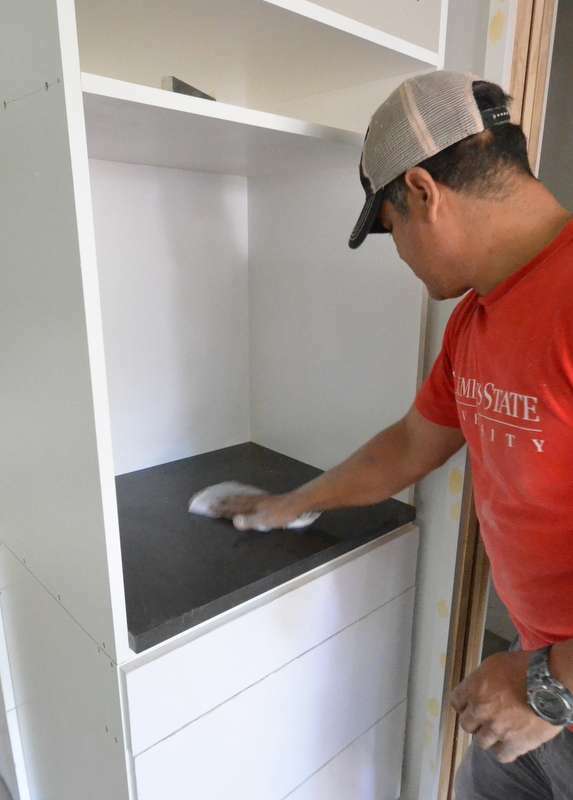 Ron offers to ask Aaron to reinstall the cabinets — but R says that variance is nothing compared to what he has had to work around on other jobs. 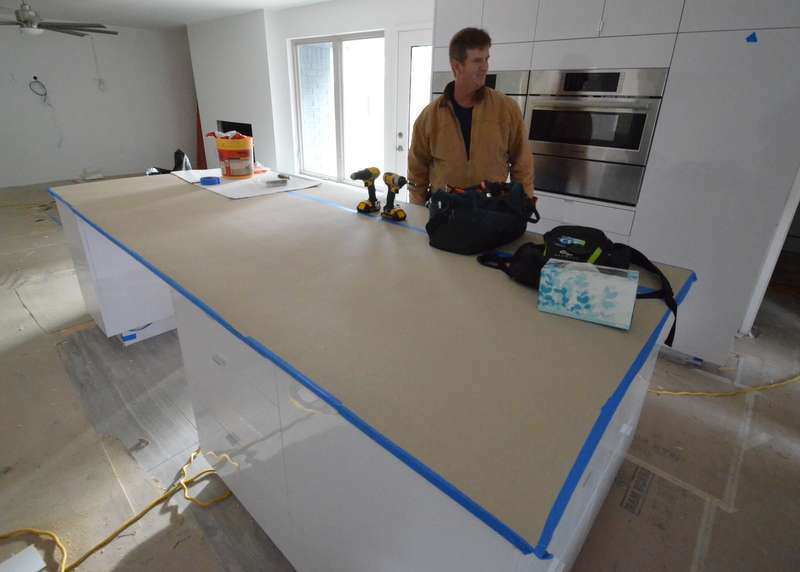 Step by step, strip by strip, R lays out what will become the guide that Austin Stone will use to cut the quartz to size, deliver, and install. One big step closer to finishing this remodel. Milestone! 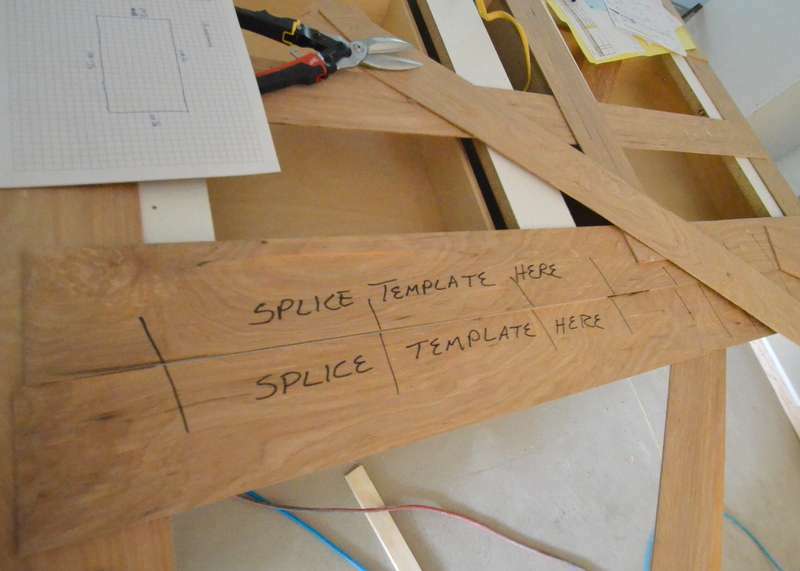 R documents on the strip every measure of the counter that the fabricators will need when cutting the quartz.